After Margherita was born in Rome on the following 2nd of October, Giovanni hurriedly took his family to Sardinia, where they still had a house to live in and relations to help them. Giovanni managed to arrange a passage on a Navy frigate from Naples to Cagliari (the port of Civitavecchia had been destroyed and Olbia was still in the hands of the Germans) and by train towards Buddusò. They remained there till after the war had ended and in the meantime gave birth to two more babies, Vincent (Enzo) and Maria Battistina (Mabi). In 1947 they all moved back to Rome, but always maintained a close contact with Sardinia, faithfully returning during each school summer holiday. Having properties on the coast at Olbia, they spent much time at the sea, being perhaps, the first summer tourists of the area. This part of Sardinia was to become one of the most important and prestigious resorts of the Mediterranean from the 1970s, renowned for its spectacular coastline and clear transparent sea and masterly developed by His Highness, The Aga Khan, with an admirable respect for the beauty of its natural landscape. However on one of these happy trips to Sardinia in 1959, tragedy struck the Satta family, with the sudden death of Giovanni from a cerebral ictus, leaving Giacobba alone with her four small children. With many sacrifices and a parsimonious care of her resources, she managed to purchase a new home in Rome and to successfully rear her children with a good education and a degree in architecture for her son Enzo. Needless to say, they all inherited her strict attitude in the management of family finances. After Enzo graduated in architecture at the Rome University, he worked for two years with Michele Busiri Vici in Rome, who played an important part in the initial development of the Costa Smeralda. He afterwards spent four years working in South Africa and on invitation from his sister in 1973, who feared political turmoil in that country, he came to work on the Costa Smeralda. Here he distinguished himself, so much that the Aga Khan Foundation granted him a scholarship to do a Masters Degree in Urban Design at Boston University. Completed this, he remained there in Boston for two more years to further his working experience, after which he returned to Porto Cervo as head of the Costa Smeralda Planning Office. 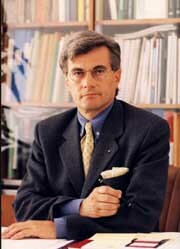 In 1994 he was elected to the Sardinian Regional Parliament and has since played a leading role in the local politics. Enzo married Mariangela Muzzu, a Sardinian girl from nearby Arzachena, with a mother from Mantova. They have two children, Melissa and Maximilian. From a previous union with Anna Sarzi Amadé from Tuscany, he fathered a son, Riccardo. In Giacobba Bacciu's family there are two figures that need a special mention. 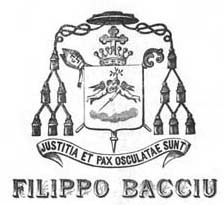 The first is Filippo Bacciu born in 1838, who became Bishop of Ozieri in 1897. The moto he adopted was "Justizia et pax osculatae sunt", meaning "Justice and peace kissed" and his coat of arms depicted two angels, one holding scales and the other a sword, with above, a dove carrying an olive branch. There was an obvious play on the name Bacciu, which translates as "kiss", but one can easily surmise a deeper meaning for the motto, such as the possible ending of a family feud, which were quite common in those times. Unfortunately the Bishop's papers were divided at his death in 1914, between the Church and his many heirs. Filippo was born in Buddusò, of a hard-working, righteous family of pastoralists, Giovanni Bacciu Farris and Maria Altana Porcu. His twin brother, Gaspare, died at birth and another brother, Giuseppe, died at Lucca during military training. Filippo, together with his other surviving brothers, Salvatore and Fedele, grew up working the land and tending to the farm animals, in respective fear of the Lord. He was very active as Bishop and generously used his personal family wealth for the benefit of his parrish: he made precious restorations to the church, regularly fed the poor and founded an order of nuns, the Filipine, to protect the poor and the orphans. He abhored ostentation and waste and invited all the priests of his diocese to provide him frugal meals on his regular rounds. One of these priests however, wanted to impress him with a rather sumptuous meal, but after the first course Filippo calmly said goodbye and "buon proseguimento" (enjoy the continuation of your meal) and retired to his room, giving the flabbergasted priest a cold lesson.